Have you “herd” about Melbourne’s latest soft serve sensation? Although the weather might be cooling down, that’s no reason not to try the udderly delicious goodness that is Milkcow. Originating from Korea and with 60 stores worldwide, this legen-dairy name has finally made its way to Melbourne’s Driver Lane! Until 31st May, you’ll be able to taste the difference of an all-organic, locally sourced soft serve. From simple flavours like Milky Cube (100% organic honey swirl topped with honeycomb wedge) to the more complex Santorini (Oreo crumbs, pistachio, hazelnuts, Italian tropical syrup, topped with a fairy floss umbrella), every serve is filled with flavour and fun. We interviewed the brains behind the operation, Angelo and Dennis, to get the scoop! Get in quick! Milkcow will only be around till 31 May. Hi guys, thanks for talking to us! Can you tell us about yourself and how you got your start with Milkcow? We are Melbourne based brothers who were eager to get into the hospitality scene. 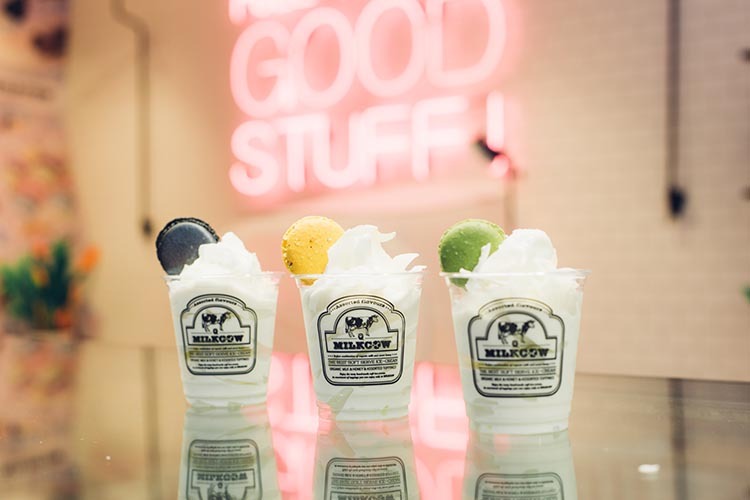 Having known about the Milkcow brand from overseas and seeing the hype surrounding it, particularly in Singapore and Malaysia, we decided Milkcow needed to be brought to Australia. 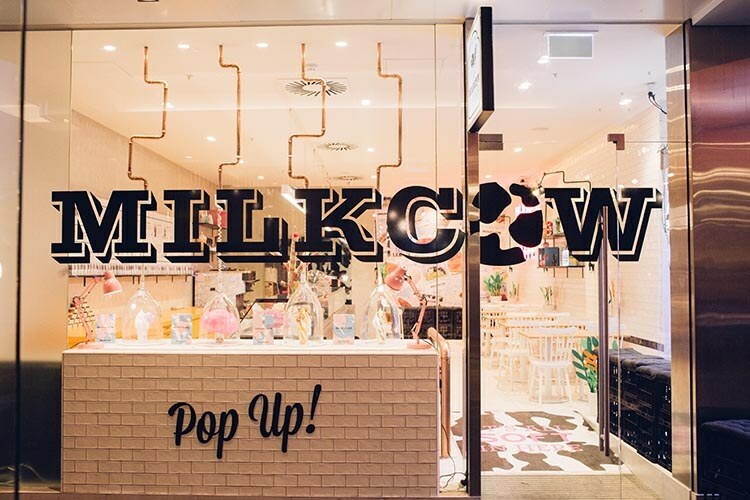 We made it our mission to launch the Milkcow brand in Melbourne’s CBD – right in the heart of the city’s action! We’re very excited about the pop-up. 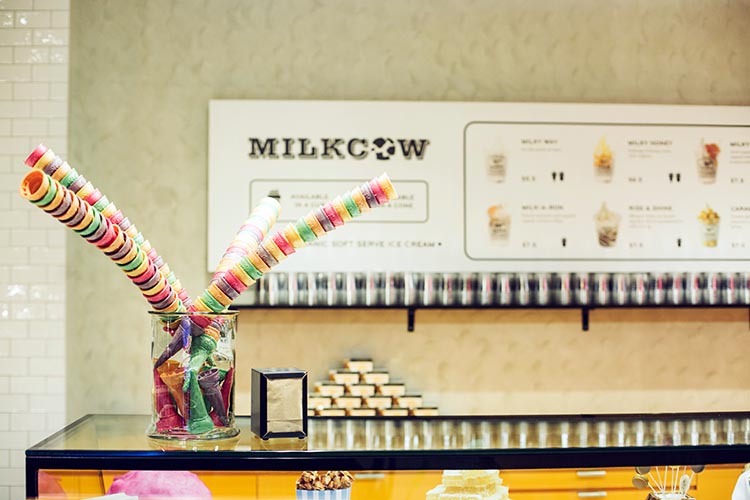 Why did Milkcow choose Melbourne? If you’ve ever been to Melbourne, you’ll know that it’s home to some of Australia (and the world’s) greatest food trends. It’s a vibrant city with a hungry population always eager to try new things. If there is anything Melburnians love just as much as their ice cream, it would be organic and locally sourced food. Delivering premium organic soft ice cream paired with locally sourced Australian toppings, it was sure to be a hit amongst the city and its adventurous and diverse population. 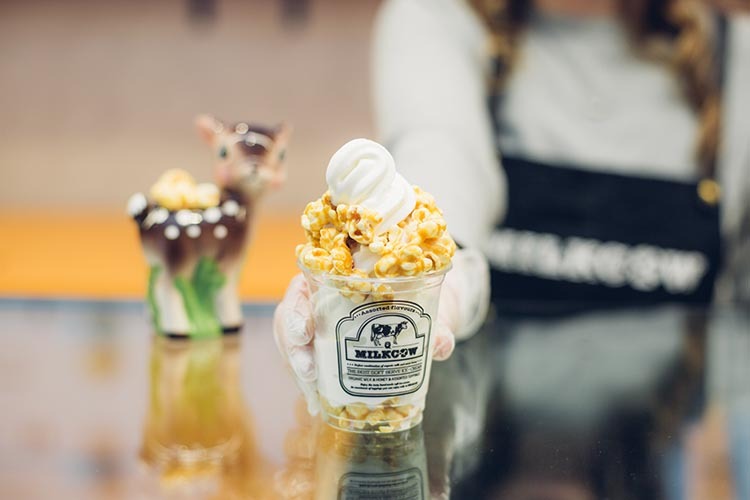 What makes Milkcow soft serve different from other soft serves? Our unique brand of soft ice cream is made from organic ingredients, making it full of that good stuff, without any of the bad stuff! It was really important to us that we source as much as possible from local Australian vendors. So all of our honey and honeycomb comes from Berringa, one of Australia’s top honey producers. And most of our toppings are sourced locally, with the exception of a couple of specialties such as our gourmet syrups from Italy, and sea salt and macarons from France. We’re more than your average soft ice cream brand in that we want to bring happiness to our customers through our delicious and uniquely crafted flavours. There are some pretty unusual and exciting flavours on offer. Where does the inspiration come from? Milkcow is all about bringing smiles to people’s faces and making their day! Perfect for indulging on your own, and even better for sharing with others, we hope that each one of our signature creations can bring happiness to everyone around us – people of all ages! Most of the flavours on offer here in Australia are inspired from the tried and true favourites of Milkcow fans overseas. We love experimenting with unexpected flavours that are simple, decadent, and even a mix of salty and sweet. We’re always in the process of trying new things, so keep an eye out for our upcoming collaborations with some of Melbourne’s most loved dessert brands. Macarons and soft serve? Sounds good to us! Oooh, we’re excited now! The flavours on offer sound amazing. Which one is your favourite? It’s a really tough decision… If we want something simple and refreshing, the Milky Cube, our signature soft ice cream drizzled with honey and a piece of honeycomb really hits the spot. It sounds simple, but the taste of the two ingredients really comes through that way. When we’re up for something more adventurous, the Santorini (Oreo crumbs, pistachio, hazelnuts, Italian tropical syrup and a fairy floss umbrella), or the Mont Blanc (Oreo crumbs, chocolate rocks and Italian apple syrup, and our fairy floss cloud) really hit the spot! Our recommendation? Have the best of both worlds and share with a friend! We hear that you’re working with BrandWorks and Amanda May Lee – what do you love about working with them? We are so fortunate to have worked with both the Melbourne design agency BrandWorks, and props atelier Amanda May Lee. 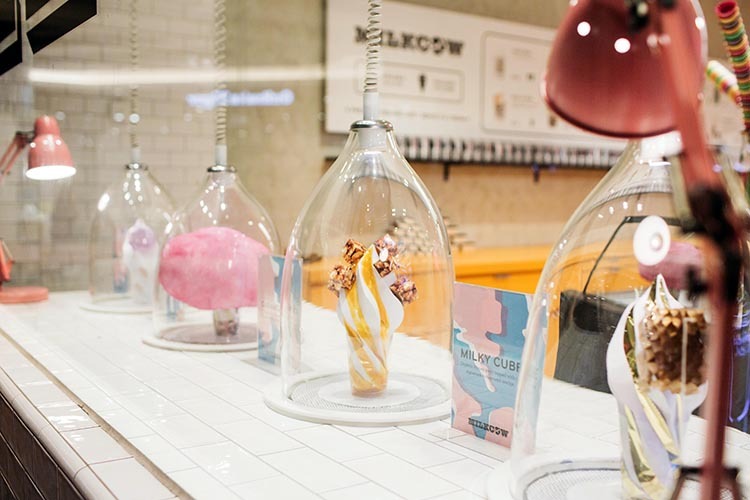 BrandWorks did an incredible job of rebranding Milkcow to better fit the Australian market, while pairing that with a really fun interior. Just being in the shop is an experience in itself! Being a new pop-up, we figured the possibilities were endless, so BrandWorks engaged Amanda May Lee to craft one-of-a-kind, giant, paper ice cream cones, fairy floss creations, and potted paper plants. 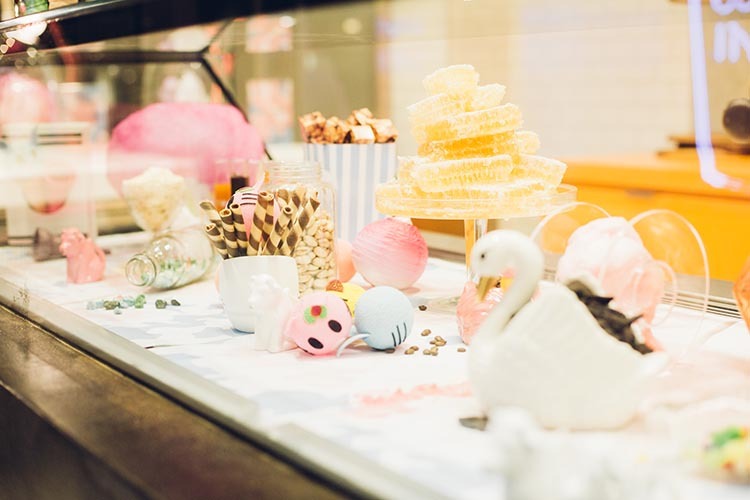 It’s really tough to walk by the window display without stopping and staring – together they did a wonderful job of bringing Milkcow to life in Melbourne! That sounds delightful! So, when you’re not feasting on delicious desserts, where is your favourite place to grab a bite? When we’re not eating ice cream (which is rare – we eat a lot of ice cream! ), we like to satisfy our sweet tooth by indulging in homemade cinnamon scrolls and cruffins at Eat A Scroll Bake House in Collingwood. They have some of the most underestimated treats in the city, which are all homemade right there in their cheery little shop on Smith Street. Milkcow can be found at The Strand in Driver Lane. Make sure you visit them soon though because this pop-up is only open until 31st May! 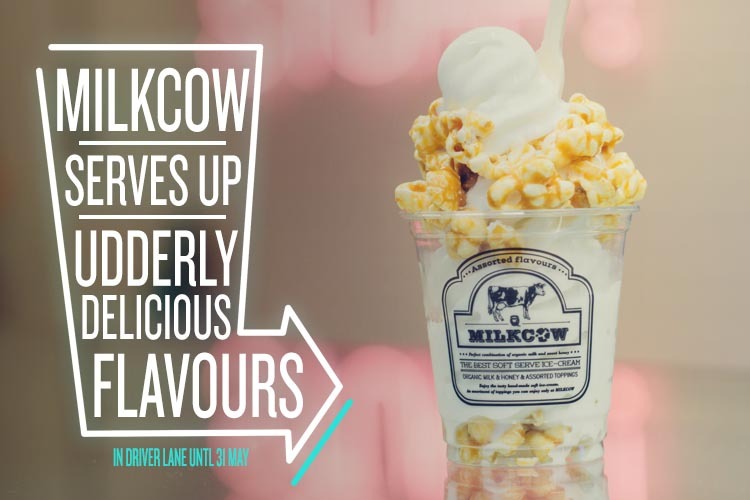 Head to Milkcow’s website to find out more and explore their delicious menu.